Low cost family life insurance protection provides your family with the financial security they need at a price that fits your budget. You’re married, you’ve started a family, and you have goals for your family's future. But, what if something happened to you? Who would pay the mortgage? How would your children be able to afford a college education? Who would pay the bills? Your spouse may need to take a job. There would be day-care costs, in addition to the loss of your income. You may have life insurance from your job. It’s usually equal to one times your annual salary. That may seem okay, but many financial advisors recommend you carry between 7-10 times your annual salary. And, what happens if you quit, leave your job, or get fired? You would need to buy life insurance, and what if you have a health condition at that time, or could not afford life insurance? These situations happen. It’s not meant to scare you, only to make you aware. Even though you have mortgage payments, credit card bills and other expenses – life insurance protection can provide financial security for your family for many years. 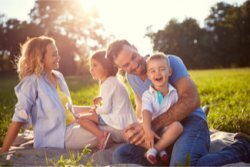 Term life insurance is a low cost, affordable way to provide up to one million dollars or more of protection for your family. You can even add additional coverage (riders) for your spouse and children to your policy. What is the financial strength rating of the insurer? The higher the rating, the more financial secure the insurer. When you request your life insurance quotes they provide the financial ratings of the insurers quoted. Is the premium level – will it stay the same for the entire policy term? Level term life insurance plans have premiums that remain the same each year for the entire life of your policy. How many years do you need coverage? Term life offers low cost options of 10, 15, 20 or 30 years of life insurance protection. How much life insurance do you need? 7 to 10 times your annual salary may meet your family's needs. However, to make sure, you may want to use our life insurance calculator to find out how much coverage you really need. Make sure to consider purchasing life insurance policies for you and your spouse. If one of you passed away, it would be difficult to provide the funds needed to replace your income, or all of the work performed by a stay-at-home parent. You can add a child rider to your life insurance policy to provide low cost life insurance protection for your children.